Instructions: Fold an 8 1/2 x 11" piece of white card stock in half to create a large card base. Select a background mat color you wish to use and trim it just slightly smaller than your card base. Ink all edges with Ranger Archival Ink - Coffee, and adhere to card base as shown. Select another decorative paper to create a long center mat as shown. Ink all edges using a Ranger Archival Ink Pad - Coffee. Next, die cut two of the decorative strips from the Sweetheart Borders Die from white card stock. Adhere the two decorative strips together, overlapping one full scallop, using a dries clear glue. Measure to coordinate with the side of the center mat, snip to size, and adhere to center mat side as shown. Adhere to card base. Using the Eyelet Rectangle and Basics Die, trim out the 4 1/4" x 5 1/2" frame from a dark blue patterned paper from the Buttons and Blooms Paper Collection. Next, trim out the larger rectangle stitched frame from the Hand-stitched Accents Die from a light blue patterned paper also from within the paper collection. Ink all edges with Ranger Archival Ink - Coffee, using stack and store dauber. Adhere matting panels together and adhere to card base using dimensional foam tape. 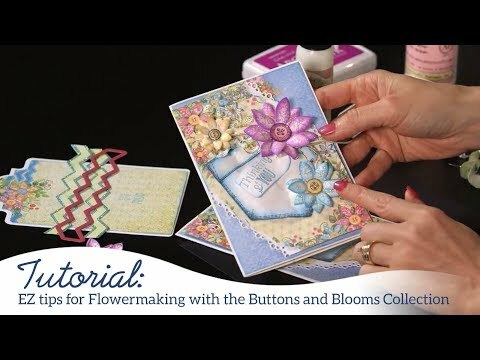 Select a premade card panel from the Buttons and Blooms Paper Collection with a small rounded rectangle image in the center. Using the Cut Mat Create 1A Die, cut out the center image. Ink all edges using Ranger Archival Ink - Coffee and adhere to layered mats on card base. Die cut the largest decorative eyelet rectangle frame from the Eyelet Rectangle & Basics Die. Adhere to center of matted card base as shown. Stamp the patchwork pocket and hexagon images onto white card stock using Ranger Archival Ink - Manganese Blue. Color pocket using stack and store dauber and Ranger Archival Ink - Manganese Blue. Color the decorative patches using Ranger Archival Ink - Leaf Green, Sunflower, Carnation Red, and Manganese Blue. Die cut using coordinating dies and adhere three patchwork accents to the upper corner of design as shown, and two to the opposite lower corner. Stamp each size of blossom, as well as button images, onto white card stock using Ranger Archival Ink - Coffee. Using stack and store daubers, color largest flowers with Ranger Archival Ink - Buttercup, mid-sized flowers with Ranger Archival Ink - Carnation Red, and smallest flowers with Ranger Archival Ink - Cactus Flower. Die cut using coordinating dies. Ink all edges of the largest flowers with Ranger Archival Ink - Sunflower, the mid-sized flower edges with Ranger Archival Ink - Vermillion, and the smallest flower edges with the Ranger Archival Ink - Majestic Violet. Color buttons as desired. Stamp two inkings of the swirling vine illustration from the Classic Rose Vines Cling Stamp Set onto white card stock using Ranger Archival Ink - Leaf Green. Color with stack and store daubers using a combination of Ranger Archival Ink - Leaf Green and Vivid Chartreuse. Die cut using the coordinating die. Shape slightly with Deluxe Flower Shaping Kit. Trim each foliage die cut into two pieces. Next, stamp arrow image onto white card stock using Ranger Archival Ink - Manganese Blue. Stamp sentiment onto arrow using Ranger Archival Ink - Jet Black. Die cut arrow using coordinating die. Adhere pocket die cut to card base using dimensional foam tape. Arrange and adhere flower clusters as shown, along with small button images as shown. Adhere sentiment to design using dimensional foam tape. Adhere real button centers to flowers as desired. Lastly, apply a thin layer of Designer Dries Clear Adhesive to each of the flower petals and glitter using Rajni Chawla's Crystal Clear.